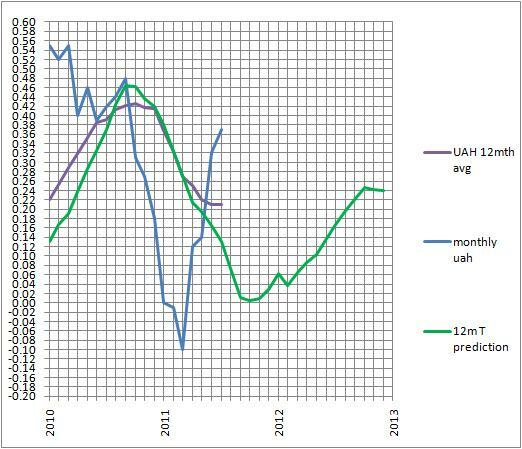 The July UAH value has kicked up to +0.37 making the running 12 month mean +0.21 +/- 0.1. So not so good at short term prediction, but I will shortly post to show long term values. The SOI has risen sharply, leading to the possibility of another La Nina event. We may get another wet spring and summer wet season in Australia, and although BOM has tipped a warm spring outlook (and temperatures have certainly warmed in the past couple of weeks) they’ve been wrong before. I expect average to cooler temperatures across eastern Australia. 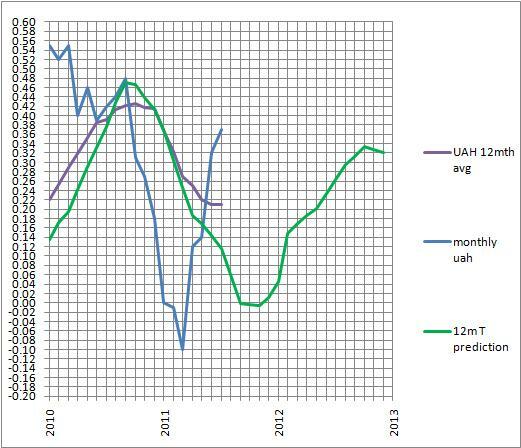 January global 12 month mean anomaly should be +0.05 +/- 0.1. You are currently browsing the kenskingdom blog archives for August, 2011.